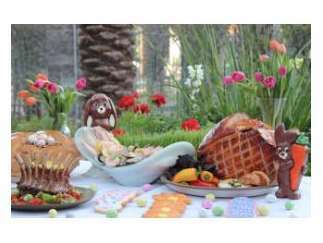 On Easter Sunday, April 21, 2019, families and friends are invited to join in Hyatt Regency Scottsdale Resort & Spa's "egg-cellent" Easter Celebration featuring a brunch buffet in SWB, live music, our "larger-than-life" Easter egg, home to a live bunny, a petting zoo and Mr. and Mrs. Cottontail as they host their 32nd annual Easter Egg Hunt... available to all resort guests and those joining us for Easter Brunch. More than 1,000 candy and toy filled eggs are strewn throughout the lawns. These separate hunts accommodate different age groups to ensure everyone gets their fair share of eggs. A most delightful way to celebrate this glorious Spring holiday! Hyatt Regency Scottsdale's Easter Brunch Buffet will be offering a variety of favorites like Omelets made-to-order, Southwest Eggs Florentine, Brioche French Toast, Soups and assorted Salads, Chilled Alaskan King Crab Legs, Jumbo Shrimp, Mussels on the Half-Shell, Smoked Scottish Salmon with traditional accompaniments and assorted Sushi and Pastas. From the carving station, there will be Bone-In Virginia Ham, Prime Rib of Beef and Fillet of Salmon, all topped off with a lavish Viennese Dessert Table. Not to forget the kids, there is even a special children's buffet!